Bushnell 111545 Imageview 15-45x70 5 Megapixel Spotting Scope 111545 FREE SHIPPING! The Bushnell Imageview 15-45x70 combines a long-range spotting scope with a video-capable digital camera, providing an all-in-one platform for surveillance and evidence-gathering. Its multi-coated optics maximize light transmission to provide a clear, bright image. The 5 megapixel camera shares a synchronized light path with the scope, making it easy to switch back and forth between them, and also has a flip-up LCD preview screen. The Sync Focus technology allows you to focus both the camera and the scope at the same time, so the captured image will be as clear as the one you see. It features an SD card slot for cards up to 32GB, so you can store your pictures easily. The camera comes with a USB port for quick downloading of images, as well as a compact tripod, remote shutter cable and soft case. 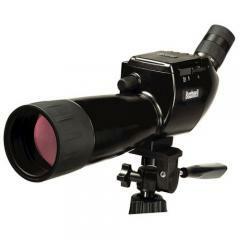 ©2002-2019 CopsPlus.com: Bushnell 111545 Imageview 15-45x70 5 Megapixel Spotting Scope 111545 FREE SHIPPING!